Could Modern Technology And Developments Improve the Abbey Line? The Abbey Line runs between Watford Junction and St. Albans Abbey stations. The track layout means that trains generally run every forty-five minutes, which is not very passenger friendly. The line needs at least a half-hourly service and it would appear from Wikipedia and other sources, that this could be achieved by re-instating the passing loop at Bricket Wood station. West Midlands Trains have promised new trains for the line, to replace the current Class 319 train. Although, these Class 319 trains are much better than their arge, as I said in A Very Smart Class 319 Train. As West Midlands Trains, use these trains for services on the West Coast Main Line, it probably helps with staffing and maintenance. But these trains are being replaced by five-car Class 730 trains. Will the shittle train be replaced by another Aventra? Search the Internet for “Abbey Line St. Albans” and you find news stories with headlines like these. It would appear that the Abbey Line has a reliability problem. The simplest possible solution to improve the line with a half-hourly service would be as follows. Reinstate the passing loop at Bricket Wood station. Acquire a fleet of three Class 730 trains of an appropriate length. 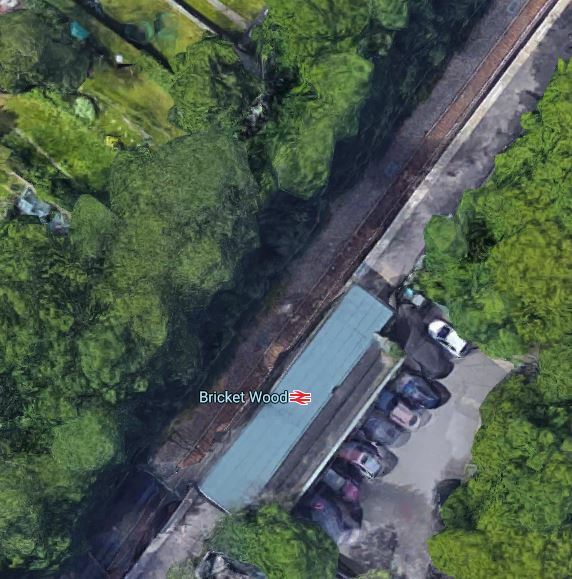 This Google Map shows Bricket Wood station. Note the single platform with a single track. There would appear to be plenty of space for a passing loop on the opposite side to the platform.. The Class 730 trains are Bombardier Aventras and I believe strongly, that all Aventras have batteries. So surely this is just the place to be innovative, with the use of battery technology? The loop would be built without electrification and the track layout would be such that two trains could easily pass using battery power. Pantographs would be raised and lowered as required. Suppose the loop started in the middle of the platform and perhaps extended for two hundred metres in the Watford direction.. The two trains would arrive at the station, with one on each side of the entry to the loop. The Watford-bound train, would switch to battery power in the station and use the loop to pass the other train to continue towards Watford. The Watford-bound train could either switch back to overhead power as soon as it regained the electrified track or wait until it is safely in the next station. When the line is clear, the St. Albans-bound train would continue on its way, using overhead power. It might also be possible for trains to go towards St. Albans using the overhead power and towards Watford on battery power, with all changeovers of power source taking place at the terminal stations, where turn-round time will be several minutes. These are some pictures of Bricket Wood station. My only worry is that the platforms may only be big enough for six-car trains. Perhaps, to avoid lengthening the platforms at Bricket Wood station, two three-car Class 730 trains could be used? Use of the five-car trains would probably require electrification of the loop, a second platform and a footbridge, which would be a much more expensive solution. The Class 769 train is a bi-mode version of the Class 319 train. So could these work the simple passing loop without electrification? At four-cars, they may be short enough to work the route without building a second platform at Bricket Wood station. But the solution would probably need the current platform to be extended to accommodate two trains. They would use diesel power to go through the passing loop. Passengers would effectively get a twice as frequent service, using similar trains to the current ones. As West Midlands Trains are also using Class 230 trains on the Marston Vale Line, which can work on electric, diesel and battery power, I can’t see any reason, why these trains couldn’t be used on the Abbey Line. They would use diesel or battery power to navigate the loop without electrification. These trains are affordable, short in length and are designed for remote servicing, but is capacity and speed sufficient? The same Stadler tram-trains with batteries, that are being used on the South Wales Metro could also be used on the Abbey Line. They would operate as trains, in the same ways as the Aventras, using batteries to navigate a passing loop without electrification. This solution would have the disadvantage of West Midlands Trains introducing another type of train, but the tram-trains could go walkabout in Watford and/or St. Albans at the two ends of the route. Under Past Proposals in the Wikipedia entry for the Abbey Line, this is said about a possible conversion to light rail. The Abbey Line leaves the map in the North East corner. Clarendon Road runs South from the middle of the map. I think it would be possible to build a bridge to take the trams over the railway. There could even be a high-level platform for the tram-trains above the station with connections to the current heavy rail platforms. What I have outlined here, is a classic use of a tram-train to allow trains on a heavy rail route, to extend to a town or city centre, by operating as trams. Could Thr Abbey Line Be Linked To The Troubled Croxley Rail Link? This map from carto.metro.free.fr shows the lines at Watford Junction. The Abbey Line goes North from Platform 11. 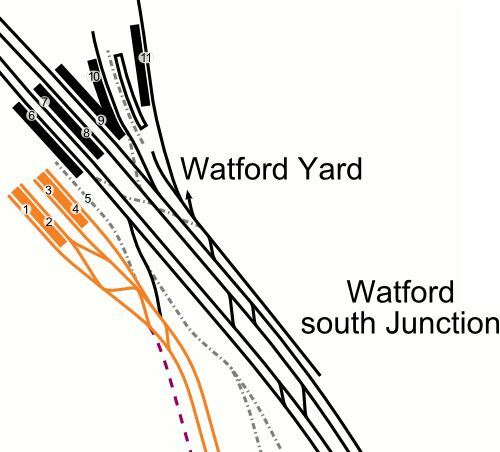 The lines shown in orange are the Watford DC Line of the London Overground, that go to London via Watford High Street station. The dotted purple line is the proposed route of the Croxley Rail Link. I can’t find any references on the Internet to the possibility of a connection between the Abbey Line and the Croxley Rail Link. I doubt that Metropolitan Line trains could go to St. Albans. They are too long at 133 metres. Extensive modifications to the track and platforms would be needed. They lack the batteries to navigate the proposed passing loop. But Stadler’s tram-trains might be able to go to Croxley station. They are under forty metres long. They weigh under seventy tonnes, which could help in the bridge design. They could work the Abbey Line using the overhead power. Batteries would enable using the proposed passing loop at Bricket Wood station. I’m sure that Stadler’s innovative engineers could make their tram-trains run on third and London Underground rail electrification. Battery power could be used on some of the route between Watford High Street and Croxley stations. I’m sure that after sorting out Cardiff Bay, Stadler’s engineers will welcome the challenge of Watford Junction. 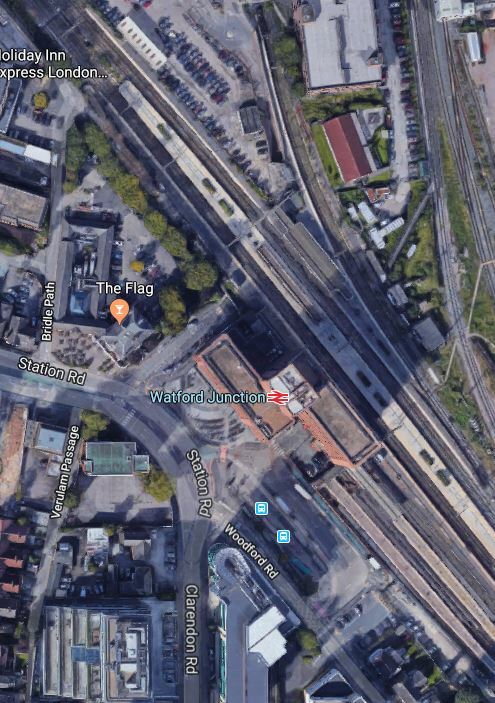 Over the last few years, there have been various plans about improving train services through Watford Junction station. It has been proposed that Crossrail is extended through the station. The Bakerloo Line will be extended and it has been proposed that it terminate at Watford Junction. West Midlands Trains will add extra services. How will HS2 affect services on the West Coast Main Line? In addition there are plans for more car parking and other developments at the station. It strkes me that there is a possibility that an innovative architect will come up with a striking scheme, that could enable bridges for trams across the West Coast Main Line. There are various possibilities to improve the Abbey Line, brought about by recent innovations in the use of batteries on trains and tram-trains. In all cases, the line gets a half-hourly frequency from new trains. On the other hand, as with the Croxley Rail Link, there seems to be a lot of ideas and plans in Watford, but no real leadership to get anything built at an affordable cost!